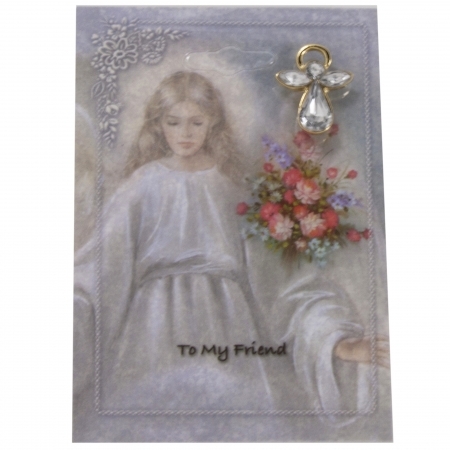 To my friend prayer card with a white diamantes angel brooch/pin. Ideal as a token gift for those in the same communnion class. Back of card reads "Angels watching over you. Have you ever had the feeling when you're all alone at night that there's someone watching over you and that everything all right. Have you ever had the feeling when you're sad - and blue that someone understands somehow and is watching over you." Size of brooch/pin is 13mm x 15mm. Card is 55mm x 80mm.